Russia in World War 2 was facing a threat to their very existence. Early in the war they could not compete with Germany in terms of technology, training, or skilled officers but they did have a tremendous population and made the decision to use numbers to buy time while their military geared up to fight a modern mechanized war. Faced with such a strong need for soldiers and factory workers the Soviet government called up nearly 8 million women, with 800,000 of those serving in their armed forces. One of the combat roles women excelled at was sniper duty. Unlike other infantry roles that rely on physical strength the best traits of a sniper are precision and patience. 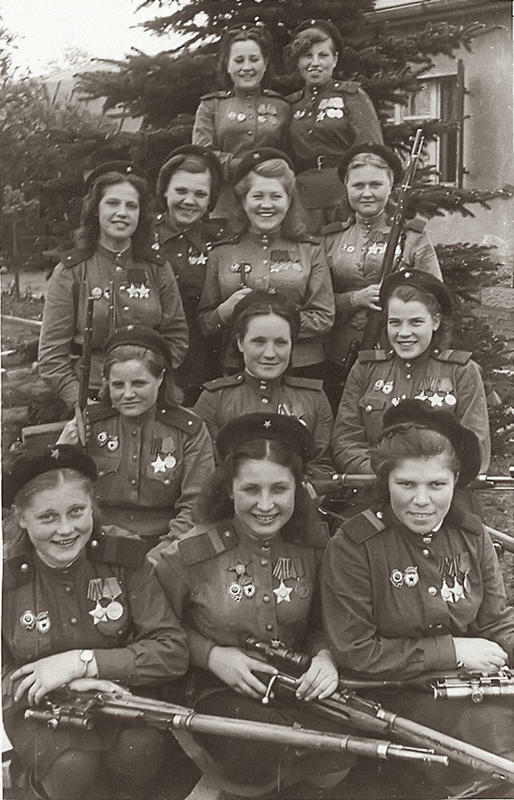 2,000 female snipers were credited with 12,000 confirmed kills by the Soviet military in World War 2. Unlike movie portrayals of snipers sneaking deep into enemy territory for high profile targets in real wars snipers are best used in a defensive role. When defending territory the snipers can fire from prepared positions at troops moving in the open. Because of this the greatest period for Soviet snipers was between 1941 and 1943, the part of the war where they were largely on the defensive. Ukrainian Lyudmila Pavlichenko, credited with 309 confirmed kills is usually thought of as the top female sniper of all time, and one of the greatest military snipers of either gender. She became a celebrity during and after the war, as did Soviet sniper Rosa Shanina. Both Lyudmila Pavlichenko and Roza Shanina were celebrated in pop culture after the war. Pavlichenko was a subject of the 2015 film Battle for Sevastopol, and the publishing of Shanina's wartime diary made her a posthumous celebrity in Russia in the 60's. Total number of confirmed kills: 775. Photo taken in Germany, May 4, 1945.